Every year since 2002 the best players are selected from the French National Basketball League to compete in an All-Star game in Paris. 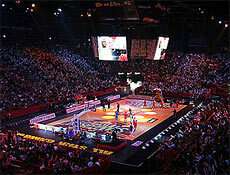 The game, played at the ultra-modern Bercy Palais Omnisport (or Bercy Sports Arena), pitches the French All-Star team against the best players in Europe brought together to form the All-Star Foreign team. The event is sponsored by Nike and normally draws crowds of up to 15,000. The atmosphere is enhanced with great music, animation and lots of surprises throughout the game.